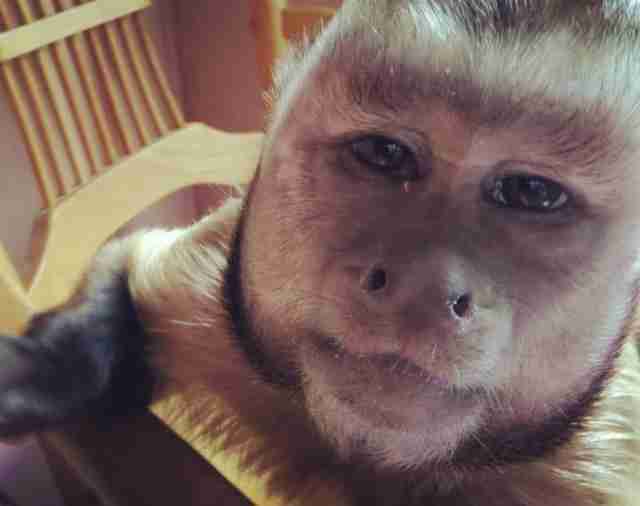 Jersey, a brown capuchin monkey, was kept as a house pet for nine years ... and it nearly ruined him. A family in Indiana purchased him when he was just 3 days old, through a breeder called Rainbow Primates, Kari Bagnall, founder of Jungle Friends Primate Sanctuary in Florida, told The Dodo. Jersey became aggressive due to the stress of being kept in captivity, Bagnall said, to the point that his family moved him to the garage. Lonely and bored, Jersey started to hurt himself. He chewed off his own toes, Bagnall said, and began nibbling at his own hands. 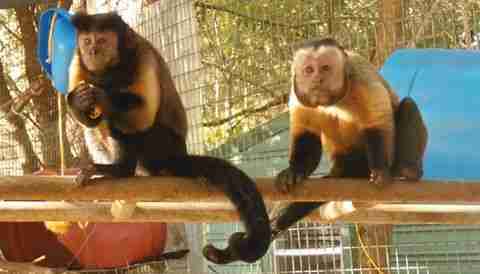 Capuchin monkeys are intelligent animals who typically live in groups in the wild, and thus require a fair amount of stimulation - bored capuchins can easily become destructive toward others as well as themselves when in captivity. 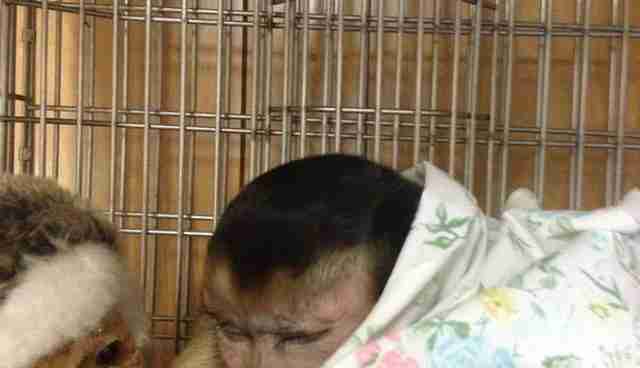 Jersey's self-harm and aggressive behavior is likely what caused his family to bring him to the Primate Rescue Center in Kentucky. 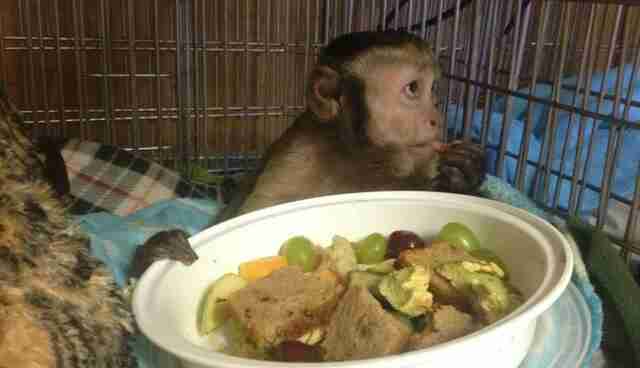 From there, Jersey was sent to Jungle Friends, which would become her permanent home, Bagnall said. 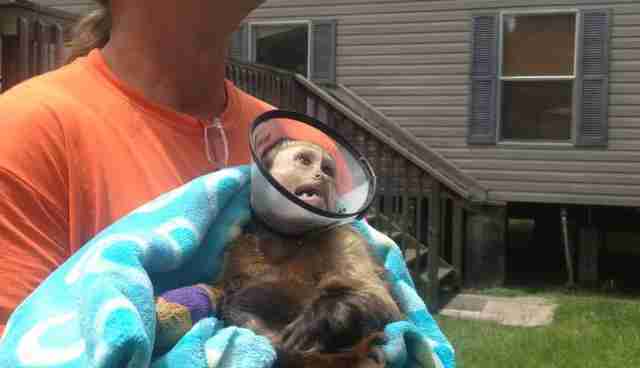 When Jersey arrived at Jungle Friends, his hands and feet were bound together, with a cone on his head. 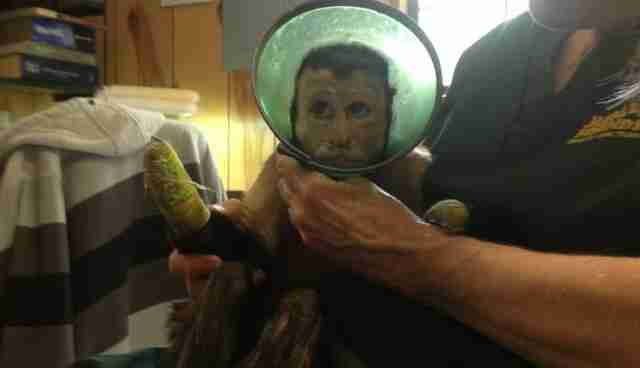 These were measures taken by the Primate Rescue Center to prevent Jersey from hurting himself any further. "Even then, he was still attacking his toes and biting [them] off," Bagnall said. Jersey had to be put on many drugs, including Prozac, to try and stop his self-mutilating, Bagnall said. One of his legs in particular was in terrible shape. "He started with his self-mutilation in boredom as a pet," Bagnall said. "But then, his leg was dying and I think that's why he was attacking it more than anything." In other words, blood flow stopped circulating to the limb. After seeking medical advice and looking into other options, including skin grafts, Bagnall felt that an amputation was be the best course of action to take in order for Jersey to lead a comfortable, pain-free life. 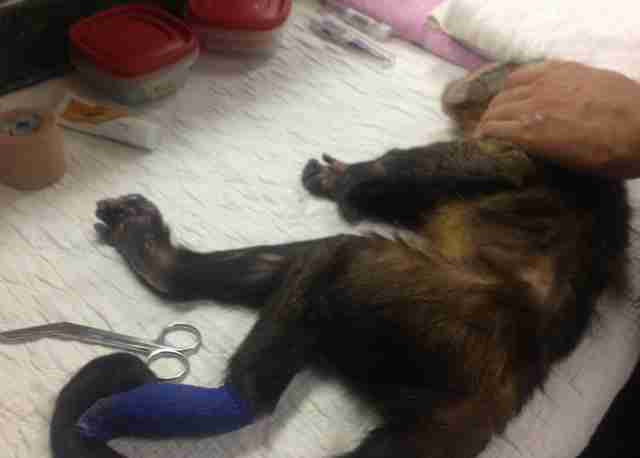 However, Bagnall's decision was met with backlash from veterinarians unwilling to do the procedure. "We had vets who didn't want to do it and said that Jersey should be euthanized," Bagnall said. "It's like this whole idea of animals ... if they can't be exactly as they're supposed to be, then kill them. And it's crazy." She also said former staffers at the sanctuary felt the same way, deeming the surgery too expensive and a waste of time that could be spent elsewhere. "That kind of attitude is not the sanctuary's attitude," Bagnall said. "Each individual at Jungle Friends deserves the chance to live." 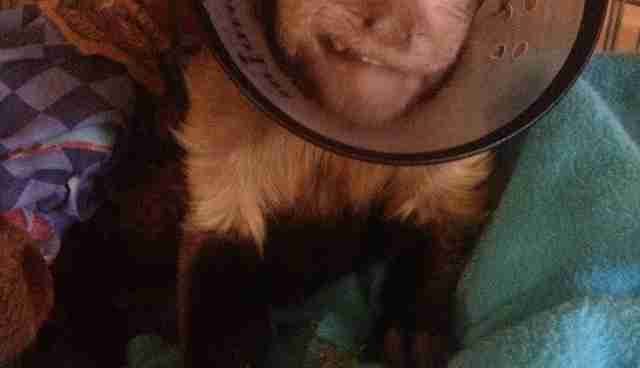 Bagnall was finally able to find a veterinarian willing to do the the surgery with the help of private donations to fund the procedure. Jersey lost his right leg and part of his left foot, both of which had become necrotic. "I never found a smile, I never saw a play face or him be happy at all, until the day we had his leg amputated," Bagnall said. "That day after the surgery, I got a big play face from him. He was like a different monkey." 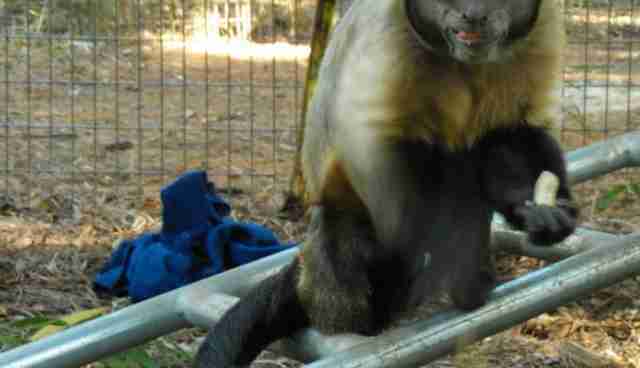 Today, Jersey runs and plays just like any other monkey at the sanctuary. 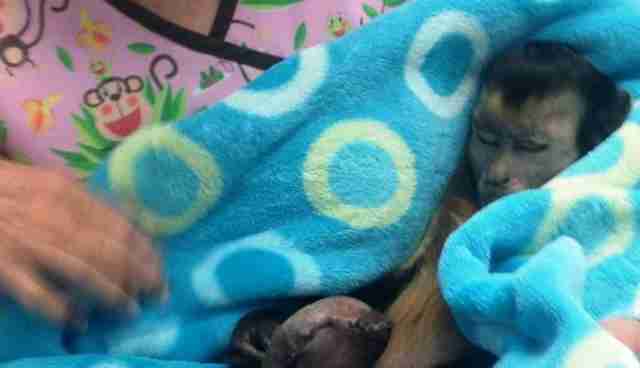 He's also found a special someone to share his life with at his forever home - another capuchin named Elizabeth. The two met during Jersey's stay at the sanctuary's clinic during his post-surgery recovery. 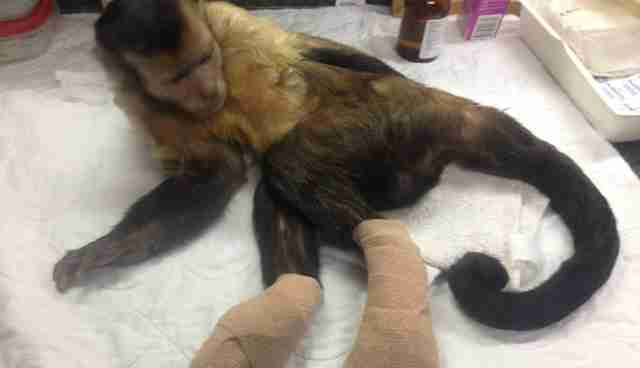 Elizabeth was sick from an infection, and Bagnall said she believed the female monkey wasn't going to make it. But then she found a friend, and more, in Jersey. "They started lip-smacking to each other and chatting to each other and we thought 'Hmm, this might work out.'" The two of them have been inseparable ever since. "We were really glad Jersey ended up taking a liking to her. They've been living together since he had his amputation," Bagnall said. "It was love at first sight." Want to help Jungle Friends continue doing good work? Consider making a donation here or sponsoring a monkey here.